We started the installation of the plumbing last weekend. The first major task was to install the waste lines. We started in the room furthest from the exit to the septic tank. This happens to be the main floor bathroom. To get the right location for the drain from the shower, it was necessary get the base plate out of its shipping box and place it where it is to be installed. It was actually a bit more complicated than that! 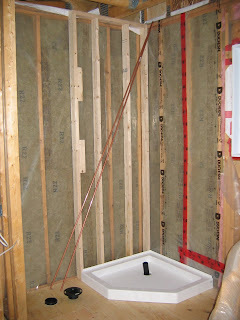 I wanted the supply lines to the shower to be well insulated. So rather than put them in the exterior wall, I created a false wall in the inside to house the supply lines tot he show tap and the shower head. When framing this false wall it is important to make sure you frame the right side area centered in the wall so that the tap and shower head are centered in the shower. BTW you can see the copper pipe for these lines leaning over the shower base. You will notice that it was necessary to insulate and install the vapour barrier in the exterior wall PRIOR to building the false wall. Now we placed the shower base in the proper location and drilled the hole. We drilled it a comfortable 5 inches in diameter to ensure there was plenty of play for the waste pipe as well future access for repairs and inspection. It the picture you can see the shower base with the the waste pipe coming up through the hole.